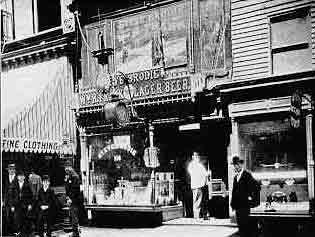 Photograph of Steve Brodie's Bar at 114 Bowery, New York City, owned by Steve Brodie (1861-1901), famed for supposed jump from the Brooklyn Bridge in 1886. The story of Manhattan as the city we know begins in the section of town known as The Bowery. In 1624 the Dutch began to settle in what they called New Amsterdam. The name Bowery comes from a Dutch word meaning "farm". Over the years this area experienced urban expansion as the farm lands disappeared to the development of the city. At first much of the Bowery neighborhood became elegant and highbrow, but near the mid-nineteenth century the area degenerated into a poor rough place. The Bowery became famous for its bars, brothels, pawnshops, and flophouses. Gangs ruled their individual turfs and sometimes clashed in violent confrontations. For over a hundred years the Bowery retained a bad reputation that was known the world over. In more recent years there has been a move toward gentrification with an attempt to attract new business and tourism. There are a number of places of historical interest to visit in The Bowery as well as art galleries, museums, night clubs, restaurants, and other upscale establishments. Samantha Redstreake Geary said: "... Whenever I think Manhattan, I think of the theaters on Broadway and the fabulous FOOD!" From The Bowery we can follow Broadway, once the Wickquasgeck Trail used by the native peoples who inhabited the area prior to the arrival of the Europeans. Broadway spans the entire Manhattan Island and then beyond. As one of the most famous streets in New York City, many known landmarks can be found along the route. Broadway has become synonymous with The Theater and most notably, Musical Theater. The Great White Way, as Broadway is also referred to as the street passes the bright lights of the Theater District, has been the subject of so many movies that many people associate Manhattan with the theater first and foremost. The only time I've been to a musical in a Broadway theater was in 1976 when I saw The Magic Show with Doug Henning who was a popular hippie styled magician for a number of years. I'd seen his first television magic special the previous December and was very impressed. Seeing him in the Broadway show that had first catapulted him to fame was a special treat for me. I was working on a touring magic show at the time and had developed a special interest in magic stage productions. This is a musical that will doubtfully be performed by many stage companies in the future due to the nature of the illusions and the right performer to present them. Doug Henning died in 2000 at age 52. Have you been to any musicals or theater productions in the Manhattan Theater District? Have you visited the Bowery? Have you seen the movie Gangs of New York? Interesting post, Arlee. I've never been to Broadway but I have seen lots of musicals in London's Theatre land. Love 'em!!! I even wrote a few musicals for school productions - in my former life :) Happy to hear that the Bowery was transformed. Have a lovely weekend. Nicola, wouldn't it be cool to have a musical you wrote produced on the big stage by a pro company? It seems like an interesting place. I've never seen a show in Manhattan, though it's on my bucket list. JH, the road shows can be just about as good. Copperfield puts on a fantastic show. I've seen a couple of his shows. Welcome in the letter "B"... thank you! Jeremy, haven't seen one of the Bowery Boys films in ages though they still frequently are played on TCM. My first thought nwas, "What would those natives do if suddenly transported to Broadway now? Prolly the same thing I'd do- and I hope there's a restroom nearby to do it in! To watch a show there has been on my bucket list for a long time now. 1624 is some while ago, the length of its history comes as a mild surprise though it shouldn't really, come to think of it. It was my good fortune to attend a Christmas musical at Radio City Music Hall in 2010. I love The Gangs of New York, have it on DVD; now I'll have to watch it tonight! Most interesting Lee. I must say when I went there I was overwhelmed by all the goings on. I saw Les Mis and Miss Saigon about 22 years ago. That was the one and only time I've been to Manhattan/NYC. I've never been to the Bowery. Sounds like a nice place to visit. Sounds like somewhere interesting to visit...it evokes all sorts of mid twentieth century images. I haven't been to the Bowery but I've been to Broadway. I saw the production of Sweeny Todd starring Angela Lansbury. That was back in 1979 or it could've been my second trip there in the early 80s. I love that I live so close that a trip to Manhattan is so easy. Still always a treat. Love to go to shows. Great post. Doug Henning passed away? I didn't remember that. I've never spent much time in NYC so I've never seen a Broadway show. But they did take me to see the Rockettes at Radio City once. I would have to say no to all three of your questions. My only "visits" to the Bowery would be through the old shows called The Bowery Boys and yearly visits to Manhattan via the movie "Miracle on 34th Street", the old version with Maureen O'Hara. I am enjoying the education about Manhattan that you are providing with your posts. Suzanne, so many movies that take place in Manhattan. I know I've seen some Bowery Boys films but it's probably been a long time ago. Arlee: Great post. I always associate the word Bowery as a byword for the British "Bedlam" or a madhouse. I believe, for instance, Ginsberg uses it in this context in the poem Howl. Very interesting, and a far richer history than I thought. I love NYC! I live 4 hours away and have been many times. I have only seen one Broadway show- CATS right before it closed on Broadway. I love to stay in the Broadway district at The Algonquin to see the resident cat. Hard to believe Indians used to live there. Oh thanks for the stroll! Been to NYC once only and only for the day. Loved every minute of it but it is so far from Labrador. Doug Henning was a Canuck! I remember him. Always seemed like a sweetheart. Good morning! I love the tour of Manhattan! I saw Me and My Girl in 1986 on Broadway and it was fabulous. I was on a college field trip and in fact we stay at a little hostel just off Broadway. Not a very nice place for a bunch of girls to stay, but we have memories for a life time. I never had much money when I was living in NYC. If I could do that time over again, I'd spend my money differently. I wish I'd gone to some Broadway shows. If I'd been paying attention, I'm sure I could've gotten to see some shows at really low prices. Ah... hindsight. A great post! No, I never saw a Broadway play. Yes, I saw The Gangs of New York. There's also a book by that title written by Herbert Asbury. Did not know that Bowery meant farm. Thanks for the history note. Haven't been to New York yet, but wanted to visit for a while. Hubs used to watch films about the Bowery Boys, which was set in the times you mentioned that it was rough or perhaps just before it became really decrepit. Every big city seems to have one downtrodden area which 'used to be'. . .
lyrics: Took a bus to Chinatown, standing on Canal and Bowery. Em, so many songs that mention New York and its particulars. History always fascinates me. Glad to learn this bit of New York History. A Broadway show is on my bucket list for sure! I think many people who think New York City, actually think Manhattan. There's really so much history there. Sarah, and I think what you think is right. I've been to Radio City Music Hall for a Rockette's Christmas Show. Both visits to NYC were brief but I still want to go to the big city again. The siren still calls this country girl from Georgia. I've seen Phantom of the Oper and Broadway! That was a real treat! Have I been to any musicals - on and off Broadway? Let me count the ways.... But then, from 89 to 96 I had a lot of friends in the city who were theatre fans, so I made frequent trips. I was even on first name terms with the guy who looked after the returns lines at the Majestic :) Happy days! Its difficult to think that any part of this area began as a farm! "They say the neon lights are bright.." I've only been there once and for only one day as my dad and my uncle figured out how to get a grand piano down a spiral staircase. Never made it long enough to go and see a musical. Then again it's good to still have items left on your bucket list, right? The history of this place is fascinating. The ups and downs of the neighborhoods alone is a study is urban development. I read about the history of Wall Street a few years ago and how that financial center started with a wall the Dutch built in the 1700's. Really interesting. Have I been to any Broadway musicals or plays? I think that list would be too long for a comment. :) I like to go at least once a year (sometimes off Broadway, too) but it does get a bit pricey. Not sure when I'll get to go again. As close as we live to Manhattan (my fiance works there) I have to admit that I've never seen any musicals or theater productions! The museums, concerts, and shopping in the city are more our speed. I would love to see Broadway outside and in. To see a Broadway Show... oh my I would be in total awe. I remember seeing a show on TV called the Bowery Boys.. my mom & gramma use to watch it all the time. It was a cool show. Thanks for sharing more history about the Bowery and Broadway! Very interesting. Hubby refuses to take me, but one day I'll go. By limo if I have too. LOL I want to see a Broadway show, on Broadway! Great post! I learned a lot. I couldn't afford Broadway when I visited in 1989, but I did manage to make it an off-broadway showing of Sweeney Todd. I had never heard the story before and when it was over, I was left thinking 'What did I just see?' but the memory is still there. I've never been to New York city yet, though I have passed that way on my way home from Niagra Falls on year. Oddly enough, I will be going to Rochester New York in a few weeks time, but I doubt I'll make it to t New York city. I'm not even sure how far away that is. Jeffrey, I think NYC is still a few hours away from Rochester if I remember correctly. Not an area that I traverse with any frequency. Quite a bit of history you shared with us. Never been outside Jamaica yet. Island not Queens. How fascinating! I've watched a couple of shows on Broadway. One of them was Machinal. It was very powerful. I love the way cities and neighborhoods are able to reinvent themselves. I have seen several shows on Broadway and have heard of the Bowery, but don't think I have ever been there. I have been to the Bowery Ballroom! Would love to catch a show on Broadway. I have seen the movie. I can only add that I saw Doug Henning on television on time. I have not been to Broadway but did watch Gangs of New York. Also, saw some shows at our theaters in San Francisco a few times. Fun post. I am enjoying learning about Manhattan! Lee, I have not seen any musicals on Broadway. We passed through NYC on our trip to Maine in 2004 and it was dark. We couldn't see much with the curtain of night. It might have been nice to gone through during the daylight. I would like to visit NYC sometime and see all the famous sights I was dose while in the city. That would be so cool. I enjoyed the history shared in this post. 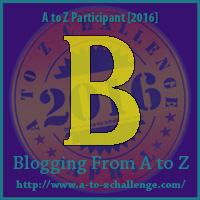 Nice job and thanks for hosting the A2Z fun, my friend! I would love to see a Broadway show one day! Doug Henning was hugely popular here in his home country of Canada. Did you know he ran for office a few times? It was shocking to learn of his premature death from liver cancer. Wasn't there an old movie series called "The Bowery Boys"? Great read, Lee. Very educational. Growing up fairly close to the city I was lucky enough to see several Broadway shows. Phantom of the Opera was one of my favorites. I have been to quite a few theater performances but, haven't yet had a chance to go to a Broadway show. It is on my bucket list, though. Never knew about this lovely place.. Thnks for imparting with such information. No for the first 2 questions and will soon see it for the last one! Loved this post! Seems like a great place. I used The Bowery, particularly its historic mission, in the earlier sections of one of my books. If I ever break even and start turning a profit with that book, I'd like to donate part of my proceeds to the mission.